A Boeing 787 Dreamliner — the sixth 787 Boeing's made so far — took off from Boeing Field in Seattle in December 6, 2011. Yesterday, it landed in Dhaka, Bangladesh, having flown 10,710 nautical miles to set a distance record for a commercial jet of its weight. It's also a victory, of sorts, for carbon fiber. The lightweight 787's built from 70,548 pounds' worth of carbon fiber reinforced plastic (CFRP), made from 46,000 lbs of carbon-fiber composite. It's the first passenger aircraft that uses composite material for its major structural parts, including fuselage, wings, and tail, as well as the doors and interior. After landing in Bangladesh, the Dreamliner, powered by two General Electric GEnx engines, refueled and continued around the world, back to Seattle, logging another 9,734 nautical miles. All told, the plane and its 13 souls aboard, including an FAA observer, circled the globe in 42 hours and 27 minutes, setting a record in 787's 440,000-550,000 lbs weight class — beating, well, no one. Yes, it's the first around-the-world speed record for the 787's weight class. A Boeing 777-200LR Worldliner currently holds the Guinness record for farthest flight by a commercial aircraft, for a flight from Hong Kong to London in 2005, totaling 11,664 nautical miles. But while the 787 still wouldn't be able to fly non-stop between the globe's two furthest capital cities, Madrid, Spain and Wellington, New Zealand — a distance of 12,388 miles, as the crow flies — Boeing says it will open up the possibility for longer non-stop routes with more flexibility than larger long-distance aircraft like the meganormous Airbus A380. 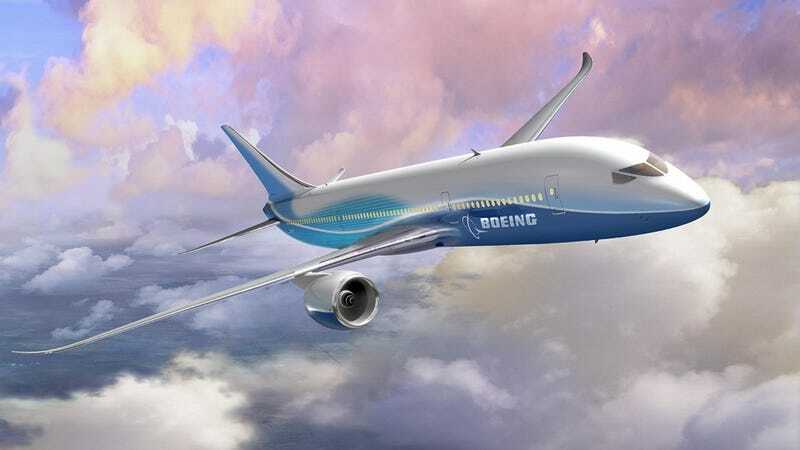 The 787 Dreamliner only holds 210 to 290 passengers, compared to the A380's 525 (three-cabin)-850 (all economy) passengers.